GWhere is very easy to use by its intuitive graphic interface. The principal functionalities are accessible in the principal window thanks to panes. The exploration of the catalogs is done as in a traditional explorer of files. The majority of the functions are accessible by mouse right click, the menus bar or by the tools bar. The functionalities are explained with tool tips. Thus simplifying the comprehension of the program for a user beginner. GWhere can be used in any supported language. If the language of the operating system is not	supported then the program will be executed in English (language by defect). The multilingual support is realized with the GNU internationalization system. It is thus very easy for a user to translate GWhere in new a language. The catalogues are stored in a very simple data base : a file. Not need to install and configure a complex and enormous data base. The format of the file is optimized not to be too large and to be able to reach the data quickly. 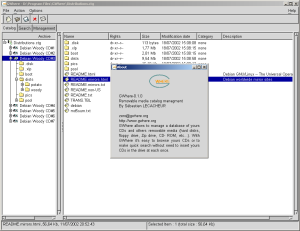 Whereas other programs require of the user to indicate which is the way to access the device to add to the catalog (and for some the device even should be mounted manually), GWhere detects only the list of the devices present and automatically mount (optional) that which will be added (the automatic eject in the case of CD-Rom can be also activated). Equipped with a powerful search engine, GWhere makes it possible to find one or more files quickly. This search engine is compatible with the regular expressions. Fast research is very easy of use. It makes it possible however to make some adjustments of research (case sensitive, ...). Advanced research (nonavailable) makes it possible as for it to make the research based on all the criteria available in the data base. This tiny gadget is very usefull in order to quickly send his own last catalog to their friends. 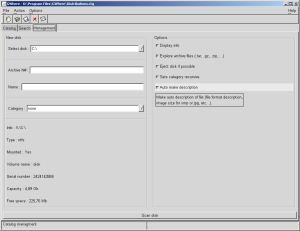 Interroperability sign, it is possible to import or export catalogs from or to differents formats. Differents formats support is done via plugins. So GWhere is not closed to no catalog format.